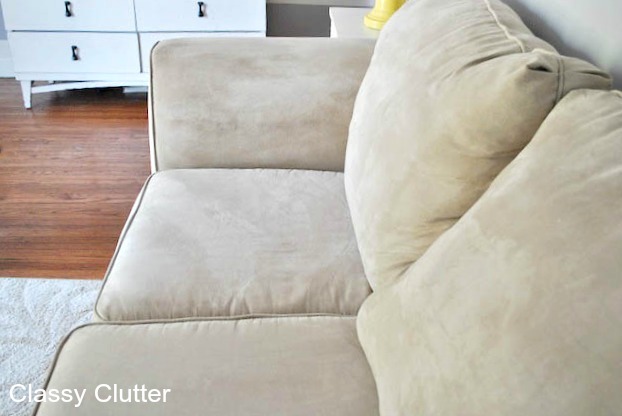 Today my friends, I’m going to teach you how I saved a boat load of money by cleaning my own sofa! 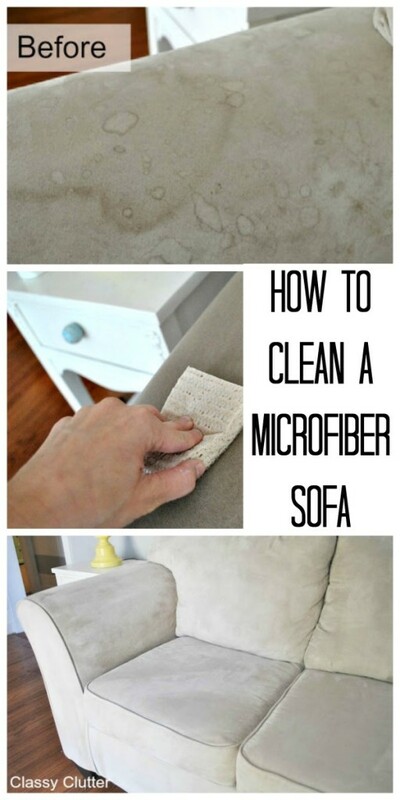 This method I have used for years now that I have had two microfiber sofas. 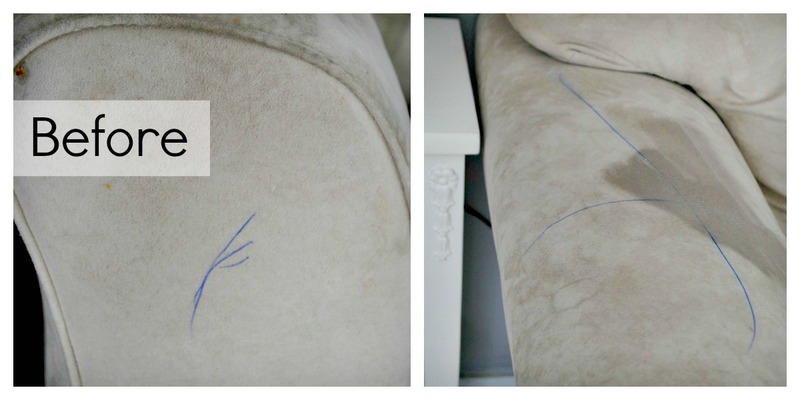 I learned this method originally when my cute little toddler decided to take an ink pen to my couch cushions back in 2009. I knew alcohol takes out ink pen so I started by using a baby wipe and some hairspray. It worked alright but I needed more alcohol, so I tried rubbing alcohol and it worked like a charm. Well, fast forward 2 1/2 years and that little toddler isn’t quite as little. He did it again!!! On my sofa that is less than a year old! BAH!!! He got a big fat time out after this one. Mommy was not happy. I used the alcohol again and spot cleaned the sofa but really didn’t try that hard. It came out okay but not great. Then, I decided to do some research and figure out what tools to use with the alcohol to get the best results! Then, two months later, my kids’Z sippy cups have absolutely destroyed several sections of the sofa, mainly the arm rests and main cushions. I’m only showing you this small section out of respect for myself. haha! I have some dignity people! 🙂 Here’s what I did to save my poor little sofa’s life! White or very light sponges – I actually found sponges the exact same color as my couch. I say this to avoid any color transfer while scrubbing. First, use your spray bottle and saturate one section at a time with the rubbing alcohol. Take your dry sponge and scrub scrub scrub! Put some muscle into and scrub vigorously. 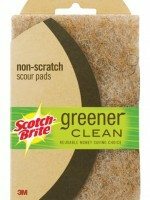 You will see the dirt, oil and grime start to come off on your sponge. I had the best results when I got it pretty wet then scrubbed really hard. As you can see, this was ink pen that was on the sofa for about 2 months and it came out completely. When the sofa is dry, take the dry white bristle brush and rub the sofa in a circular motion. 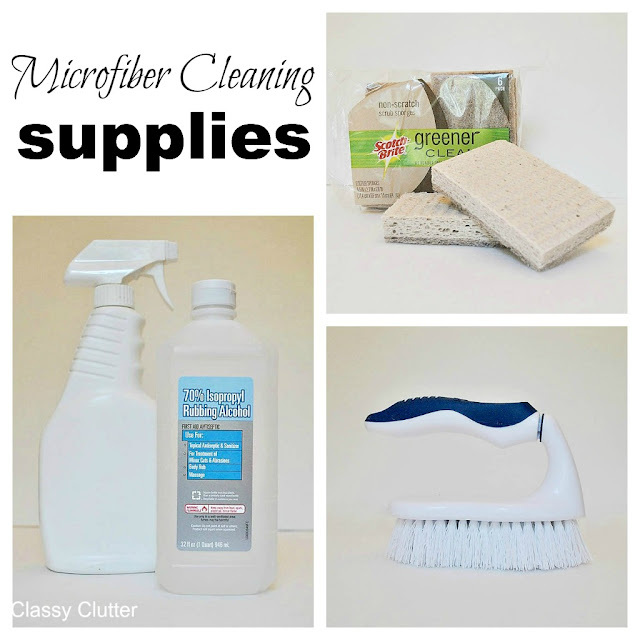 This re-fluffs the fibers and makes it feel new again! YAY!! Doesn’t it look brand new??? I’m so proud of my scrubbing and my new “no sippy cups on the couch” policy is in full effect! 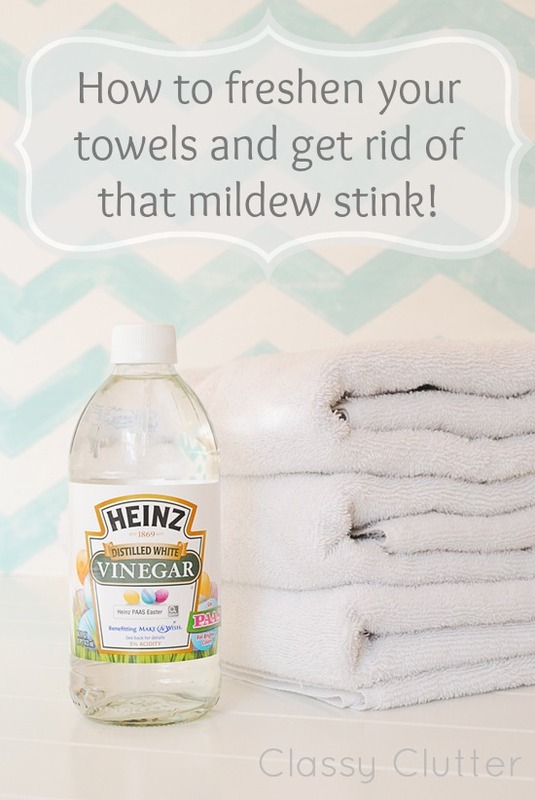 how to freshen your towels and get rid of that mildew stink! Wow, I’ll definitely have to keep this in mind. This is a great tip! Thanks so much for sharing. We’ve had a throw on our couch for over a month covering up a weird splotchy stain that appeared out of no where. I’m trying this as soon as I get home from work tomorrow afternoon! I may be easy to impress, but I am stunned! I had no idea that was possible and I’m always afraid of making spots worse/more ground in so I don’t always even try. Nice job. Glad you were able to get all that out.. Awesome! We too have a microfiber couch and a baby that is very talented at spitting up. I’ve been spot cleaning with just a rag and water, but this looks like it would actually do more than just spread the goo around. Hey, l have a question. do you rinse the sponge out between sections so that you’re not robbing the old dirt back in, I know that’s adding water as well as alcohol but it seems like it would go back in if you didn’t? So we have the same exact couch. Purchased pre-children and now we have 3. Every time I look at its flithiness I wonder what I was thinking when we bought it. 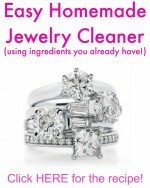 Can’t wait to try your cleaning method! Thank you so much! I have an identical couch (just a different color) and my couch arms are looking FAR from new. I’m definitely going to give this a try! Wow! 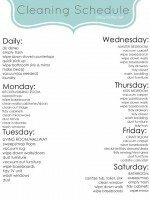 !..I’m pinning this & also making a copy of your directions..I have the same color couch & have 2 grandsons & 2 dogs..Bless you for your research & sharing it with us!! So awesome! We have a microfiber rocker in my daughters room and it looks horrible! This is on my to-do list….THANK YOU, THANK YOU, THANK YOU! OH MY GOSH! I soooo needed this in my life! With a two year old and sippy cups and a mechanic husband, my couches and recliner are in a sad state! Thanks for sharing! I just got a micro fiber couch off of craigslist that we love. One of my pooches (I think) looks like they peed on it while I was in the shower. Does this work on wet pee stains too? Do you have any way to get the smell neutralize so they don’t keep peeing there??? 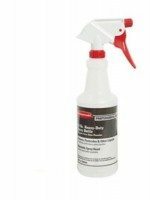 For pet urine use Nature’s Miracle Advanced Stain and Odor Eliminator. 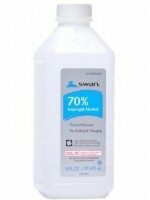 It’s enzymatic cleaner and comes in different scents. The enzyme proteins break down (change) the urine instead of diluting it. 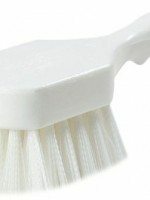 It’s best to try to pull most of it out with a dry cloth or paper towel before using the cleaner. 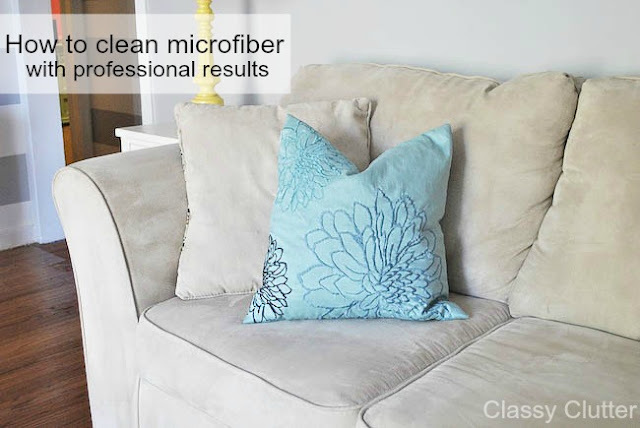 Pinned this immediately because I just got a new microfiber sleeper sofa! Thanks so much! Visiting from TT&J… Rhonda @ home.made. Your couch turned out beautifully. I need to do this to mine. It has seen better days. Thanks for sharing. Fan-freakin-tastic! I love, love, love your step-by-step pictures. 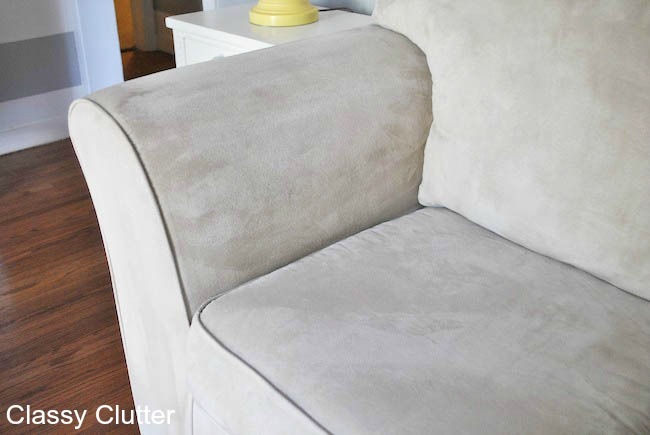 I have a four year old microfiber couch that is so stained it’s embarrassing (and banished to a never-visited room!) Thanks so much for this-I’m going to try it this weekend! Pinning! Oh, and visitng from TT&J! I tried the rubbing alcohol method on our microfiber couch and it didn’t work at all. 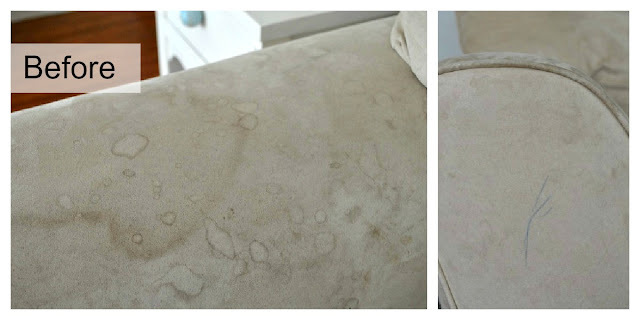 Our sofa had similar marks like yours did (mystery spots that sort of look like water stains). Any suggestions?? Oh no! Make sure you saturate it pretty well and scrub hard with the sponge. The alcohol will evaporate pretty quickly. I was able to get all the stains off of ours. I just gave this method to a friend after her son colored on the sofa with ink pen and it worked really well for her as well. Hope that helps! Never used the alcohol method ive always used pure acetone diluted with a lil water and MAGIC!!! Will this work for other colours? 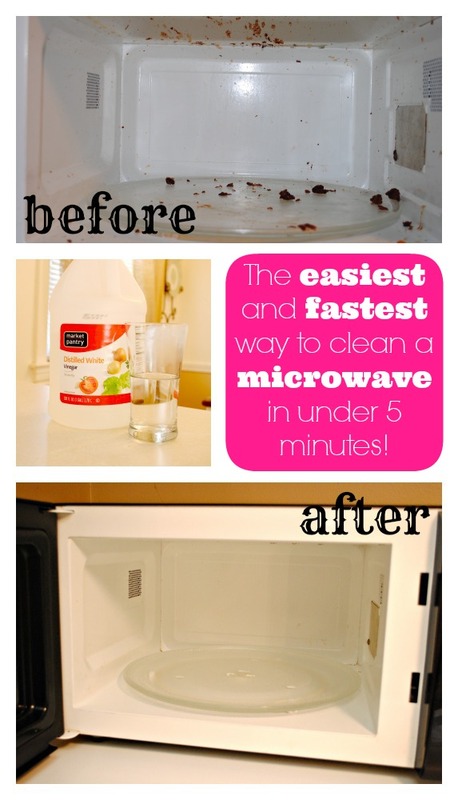 Do you think this method works on water stains? We got caught in a rain storm, ran to the truck, but not before getting soaked. Where we sat, left water rings. I don’t know where to start. Hi Gloria! YES! It should work! It worked on water and milk stains for us from the kids’ sippy cups! Make sure to get it pretty damp with the rubbing alcohol and scrub until you no longer see the water spot outline(s). Will this work on a regular fabric couch? Amazing ideas! Especially for the upholstery of the furniture in the living room where most of the people spend there a lot of time. Thanks! OMGee!! I have those exact sofas, a 3yr old and stains that look exactly like that! I was JUST trying to clean them yesterday with no luck! I can’t wait to try this! Thanks for posting! What about if it is brown? Will the alcohol do anything to the color? Hi, this works so great for my couch and recliners! just wondering how to keep it that way? Wow! The results look incredible! 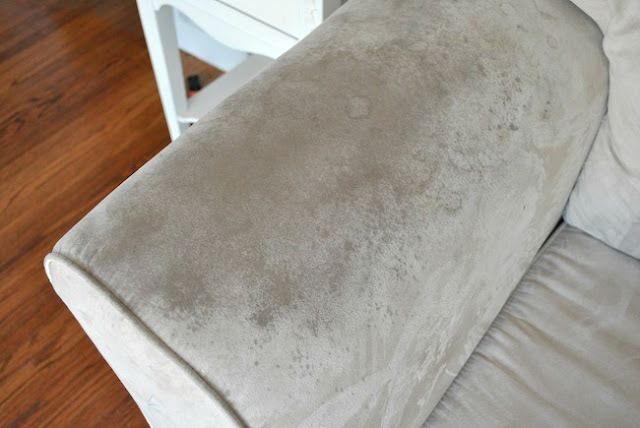 I have a few stains on the upholstery of my sofa and I don’t know how to clean them. Thank you for sharing these easy and affordable solutions! Before I cleaned my microfiber couch. I went to Walmart and bought a bag of “filling” from the craft section. Unzipped the cushions and then followed your cleaning instructions. Looks like the day I bought it! 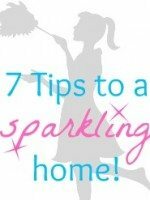 Fantastic tips! My daughter did the same thing to our sofa. She have decided that she can write on it! This made me mad. I couldn`t clean it with detergent. I am so glad that I have found your article. Now I am going to try your method. Thank you for sharing it! Best regards! This one fantastic tutorial. Thank you for taking the time to write it down and share it the community. I love this trick! I have a microfiber sofa with stains that need to be cleaned. My sofa tags say that it can only be dry cleaned. Do you think this method will work in that case? 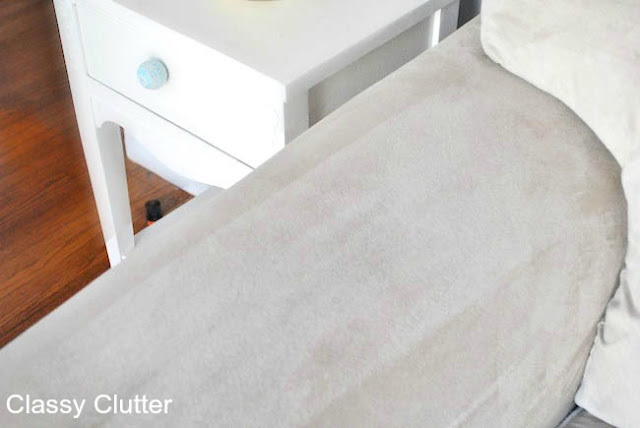 Could you please write a comprehensive guide on how to clean rustic looking rugs next time. I really loved how thorough this one is and would like to know if there’s a way to clean rustic rugs, but couldn’t find anything noteworthy online. Works like a charm! My 8 year old sofa looked bad. I used those “car buffing” white cloths & the rubbing alcohol in a spray bottle. The cloths got embarrassingly filthy & the couch looks GREAT! I can’t believe the difference. The smell goes away fast too, I was worried about my couch smelling bad but nope. TRY THIS! Thanks for all the details. 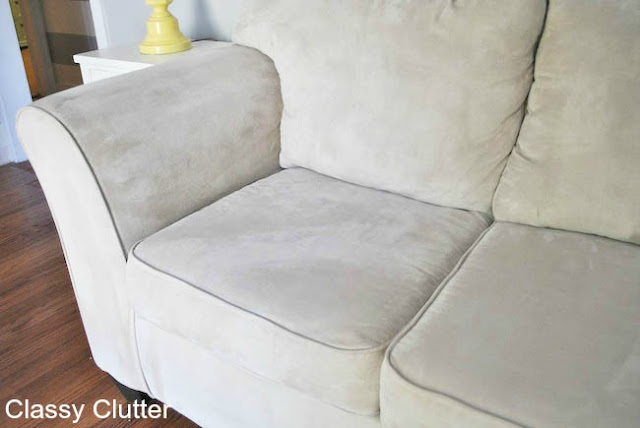 Microfiber couch with a plain white cloth, pressing the cloth down and lifting straight up rather than rubbing. 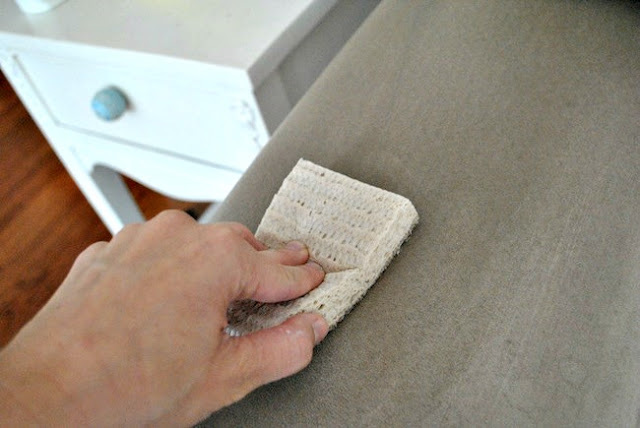 To get rid of stains and watermarks, fill a spray bottle with rubbing alcohol, spritz the stain lightly and rub with a white or natural-colored sponge. I cannot believe how well this method worked. I was the embarrassed owner of a microfiber couch in the same colour as your own but with a dog and three boys it was in way worse condition! I got to work this morning and WOW! I also used a magic eraser on top of it all figuring it couldn’t hurt. The results are so amazing…looks like new. I am so glad that it worked!! 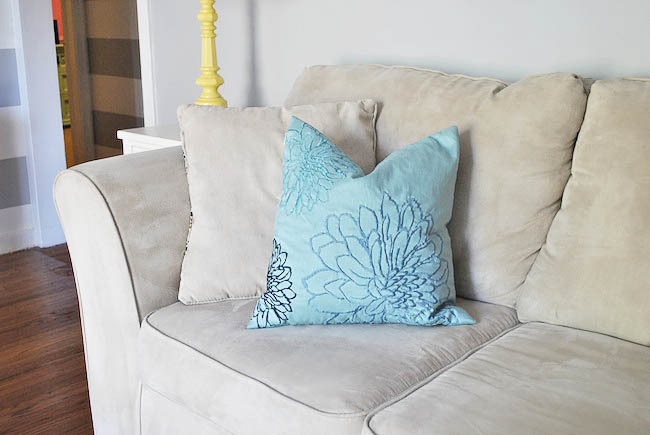 Thank you so much for sharing such a nice and very informative blog about cleaning sofa. Did this post get removed? I was hoping to come back to it to clean my sofas before I move but there is no longer any text on the page.